This photo has no real explaination. We pulled over to get gas and next thing I know this thing is looking at me and I kept real still. I felt like I was in Jurassic Park and it was important to not make a sound or he would pounce on us. 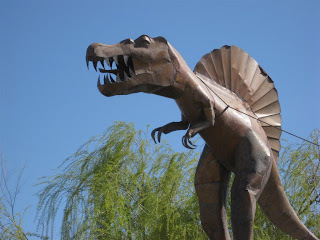 Then I realized it was not real and someone had made him out of metal. I took a photo so that if I ever wanted to tell this story i would have proof that it actually existed. 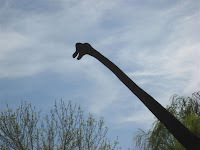 I also photographed a few other dinasaurs while we were gassing up and their photos are here..